Google & Health Anxiety | What Is ‘Cyberchondria’? Some people have always suffered health anxiety, which can be defined as excessively worrying about personal health to the extent that everyday living is seriously affected, and to an amount that is out of proportion to actual health levels. Health anxiety (which was previously described as hypochondria) focuses around someone noticing sensations and changes in their body and automatically assessing these as signs of a health problem. Often people will find themselves excessively checking their bodies, thinking about their health or seeing a range of health professionals. Another key way that people (unhelpfully) deal with health anxiety is by frequently researching health related information. Prior to the ease of internet searches some people with health anxiety did refer to medical text books and visit their GPs but it was often harder to get easy-to-read information about health problems. Most people didn’t bother their GP until they were obviously physically, or mentally unwell. It was all too much effort. Now it is all too easy to access an excess of medical information with which to self-examine your state of health and come to the conclusion that you are actually ill, even if you are not. The arrival of digital fitness devices, apps and websites (of varying quality) can also encourage concern, especially to those who are already struggling with anxiety about their body and health situation. Whilst Google is useful in giving us good information quickly, it often doesn’t make a good system for diagnosing health problems. This has led Psychologists to coin the term Cyberchondria to describe a growing number of people who are becoming more worried about their health through the vast amounts of information available at the click of a button. A number of things in your life can increase your risks of developing a pattern of Health Anxiety. Common examples are things like, the sudden death of a family member, or someone close to you becoming suddenly and seriously unwell – or being poorly for a long period of time. In your childhood, one of your parents may have been continually over-concerned with your state of health so that you regularly worry about it in adulthood. If you are a worrier about most things it is very likely that health will be high on your list of worry priorities too. As well as being a problem in it’s own right, health anxiety could be symptomatic of a different psychological problem such as depression, which is why it’s always best to seek an expert opinion if you are struggling with revised anxiety for more than two weeks. 1. Taking Avoiding Action: every effort is made to avoid any situation where health might feature. This would include talking to anyone, including a doctor, about health matters. No watching TV medical/hospital soaps, reading health articles, avoiding health questionnaires, avoiding pharmacies and avoiding any physical activities that might strain your body and cause an illness. Consistently avoiding action is mentally draining and can significantly interfere with normal life. It also means that unhelpful ways of thinking about your health aren’t properly challenged, and so your fear of health problems keeps going. 2. 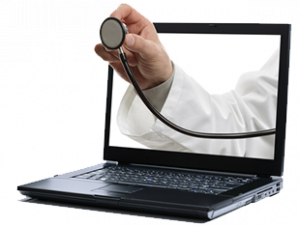 Researching Medical Information & Seeking Reassurance: becoming a cyberchondriac, hoovering up as much information on health symptoms and associated illnesses as possible, frequent visits to the doctor for advice, requiring tests and scans. Armed with the results, probably indicating there is no illness, you seek constant reassurance that you are well and not ill. You accost your family and friends with what medical information you have researched and seek their advice and reassurance that all is OK. You probably visit the doctor again, and again seeking reassurance and more request more tests and scans following further research through Doctor Google. If you keep trying you can find something that you feel is not right with your body and exaggerate its significance. After all, none of us have the perfect body and we’re all prone to unpleasant sensations or complications at some point. Once we notice sensations or things which aren’t quite right, this often leads to more self examination and more anxiety build-up. Any relief you get from positive reassurance is short-lived. Its effect will wear off quickly and more reassurance is sought. You will be chasing the tail of reassurance in ever faster circles. The health anxiety circle starts with a trigger, such as a stressful event, reading medical articles, news of a potential flu epidemic, or unusual body sensations. You then feel tense and start worrying. There is more focus on your symptoms (which often increases their intensity) and Cybersearching can begin. In the past it would probably have been several hours before you could access information about health problems through researching – but now Google is only a moment away . Before long anxiety kicks in and more symptoms are discovered as you research. Reassurance that you are well is sought from doctor, family and friends, normal life is interrupted by your anxiety, you take days off from work. Negative thoughts dominate and the vicious circe starts again. 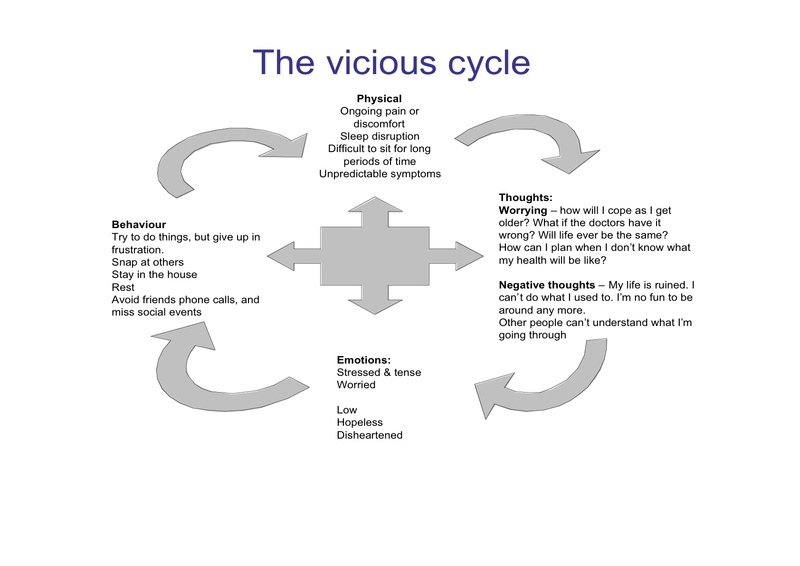 The longer you let this circle whirl around the worse the anxiety will become, even to the point of depression. In the last six months how many of the following statements are true for you? Have you convinced yourself that you have a serious illness based on perceived symptoms? Has this caused you any distress? Do you feel panicky from time to time about your health? Do you feel nervous, worried, tense, other-worldly, tired motor than usual? Do you have negative thoughts, such as ‘I must have cancer’, or ‘I don’t believe the doctor is telling me the truth, or “that tingling feeling in my leg must be that start of multiple sclerosis’? Has your health preoccupation had any negative impacts on you family, social or work life? Have you continually researched Doctor Google for symptoms and self examined yourself? Do you research for 1-3 hours per day? Is your social life affected by your anxiety? Are you takings days off work? Have you sought reassurances from your doctor, but do not believe the doctor’s diagnoses that there is nothing physically wrong with you? Do you constantly seek reassurance that you are well and not ill?If you agree with most of them you have health anxiety. What could you being doing and enjoying if you were not continually worrying about your health? Stop reading about anything medical matters and stop searching the web – even if this is hard. The tips above may not be sufficient, as your Health Anxiety may have taken a firm grip on your life from wake-up to bed-time and a restless night fretting. If this is the case you will require more than self-help books and need psychological treatment such as Cognitive Behavioural Therapy (CBT) from a professionally qualified therapist. We’re Experts in Health Anxiety. You Can Book An Appointment At Our UK Clinics and Online. Emotional Wellbeing TED-Ed Series | What is Depression? Take a Health Anxiety Questionnaire and get a free report.